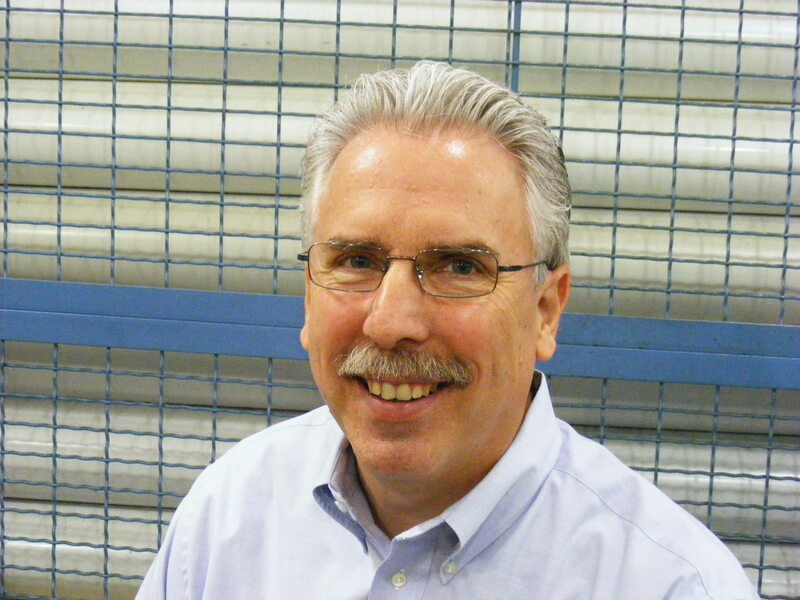 Deploying what we have- our people, our talents, our assets- to their highest and best use maximizes their return and maximizes everyone’s satisfaction. Change happens in our lives, in our families, in our organizations. Wonderful memories of holidays, birthdays, and special occasions. My parents married in 1950. My mom was Canadian, and she shopped at our local Loblaw’s, which was a Canadian grocery chain that had stores in Ohio. A familiar taste of home in her new country. Today we have frequent shopper cards, frequent flier miles, and store perks. 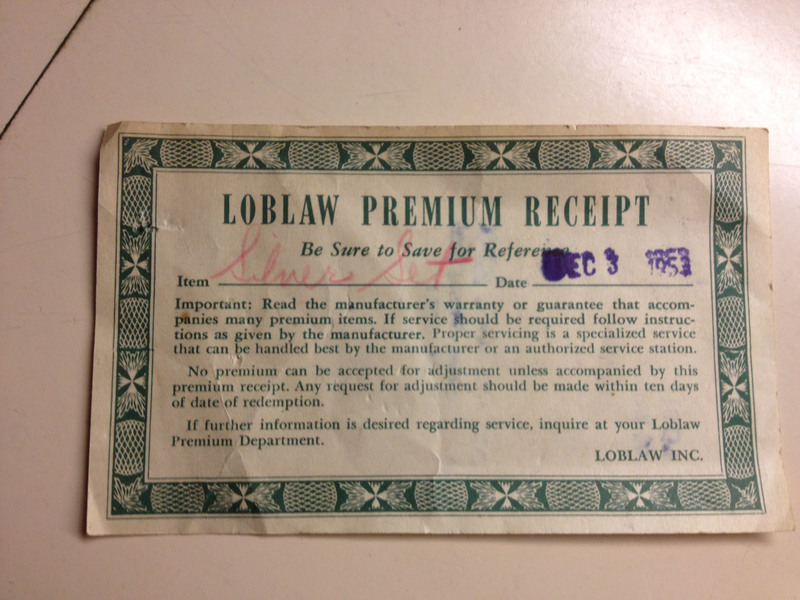 In the 1950’s, they had S&H Green Stamps and Loblaws also had “PC’s”- Premimum Coupons. You could purchase these premium coupons based on the dollars you spent on your groceries. 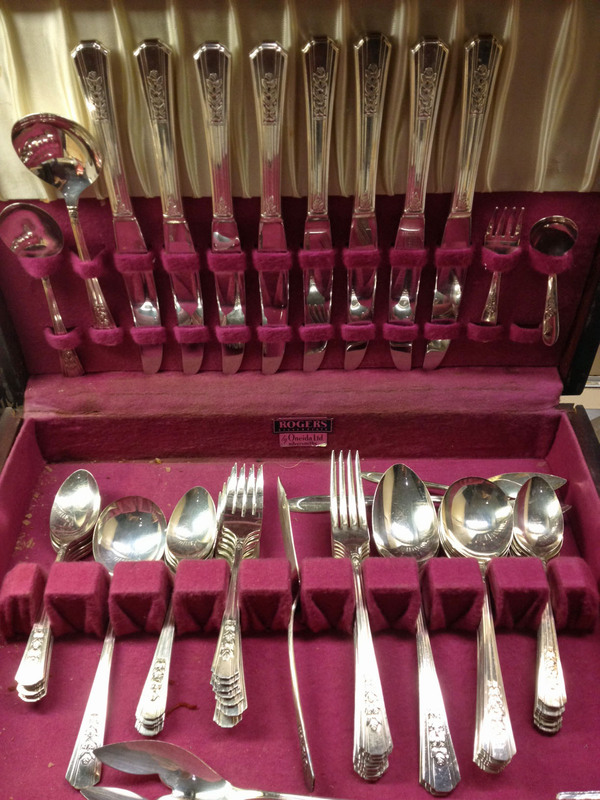 You could redeem those coupons for ‘Premium Merchandise.’ My mom stretched her budget and maximized her buying power with Loblaw’s PC’s which she redeemed for this 8-place setting of Rogers Silver flatware in 1953- just in time for Christmas! Before there were frequent shopper programs there were other ways to reward customer loyalty. The silver and the fancy plates came out for every holiday, birthday, and happy family gathering. Until my folks retired. They retired to Florida, half a continent away from the Ohio branch of the family, and the silver never again saw the light of day – or of candles on the table. It too was retired. A few years ago, I helped my dad move into assisted living back in Ohio. I helped him clear out his home. He asked me to take “Mom’s Silver” and put it to good use. But my family was already dispersed- both daughters married and out of state; my son at college. When they returned home for holidays, we were so happy to spend time with them, that what is now the “Family Silver” was the farthest thing from our mind. What is the highest and best use of this asset we now call the Family Silver? For us, the joy of still having it connects us to memories of happy days of a different era. But our entertaining is mostly behind us. The silver is a wonderful trophy, not to the victors, but to the survivors. It is just a trophy. What higher and better use could it have? Her sister is deployed out of country, she does not need more ballast from home at this stage in her life. I think that its highest and best use will be with my daughter as she builds new traditions, and memories with her husband and their friends in their home in Wisconsin. Change happens. It happens to families. It happens to companies too. Loblaw’s no longer has stores in Ohio. When my brother moved to Canada he met Bob Loblaw, of the Loblaw family. Bob Loblaw was designing left handed surgical tools for left handed doctors. I’m not sure how that worked out, but it is a far cry from the retail grocery business. What about our companies? Are we deploying our company’s assets, both technical and human, at their highest and best use? Like the family silver, they may be assets on the books, but if they are not being utilized effectively, if they are not deployed at their highest and best use, what are they really to us? As a guy with more years in manufacturing and quality than I would care to admit, I would say this: They are a loss. A loss to society, a sub-optimum arrangement that prevents your company from achieving its highest and best. This story about the ‘Family Silver’ isn’t just about the family silver. It is a lens to help us understand that the idea of ‘Highest and Best Use’ is the way to maximize our effectiveness. Jim Collins talks about having the right people on the bus. Then on the right seats on the bus. Assuring that your people are operating at their ‘Highest and Best Use’ is another way of getting at the truth behind Collins’ point. I hope that you are operating at your highest and best use. And that the people and processes under your authority are too. Highest and best use. It is the key to happiness, success, effectiveness and satisfaction. Oh- if you read this post, please don’t tell my daughter… we’d like it to be a surprise when she visits next.